Power as an essentially needed and incessantly used infrastructure is well recognized as a great stimulator of economic growth. Realizing this, the National Electricity Plan was formulated with a mission to electrify the whole nation to change the face of rural India. The standards of performance stipulated by the regulators and standards to be squarely met in the planning, erection, operation and maintenance and safety aspects of the network require constant up-gradation of the system. All this has brought forth a qualitative change in the objectives, priorities and functioning of the Power utilities to garner and upgrade all resources including human resources, to ensure that the targets are met qualitatively and quantitatively. It is essential to enhance the technological and management skills of the personnel to create awareness on the latest state of art technologies with a clear perspective to select the best, through well designed and subject specific training programmes. 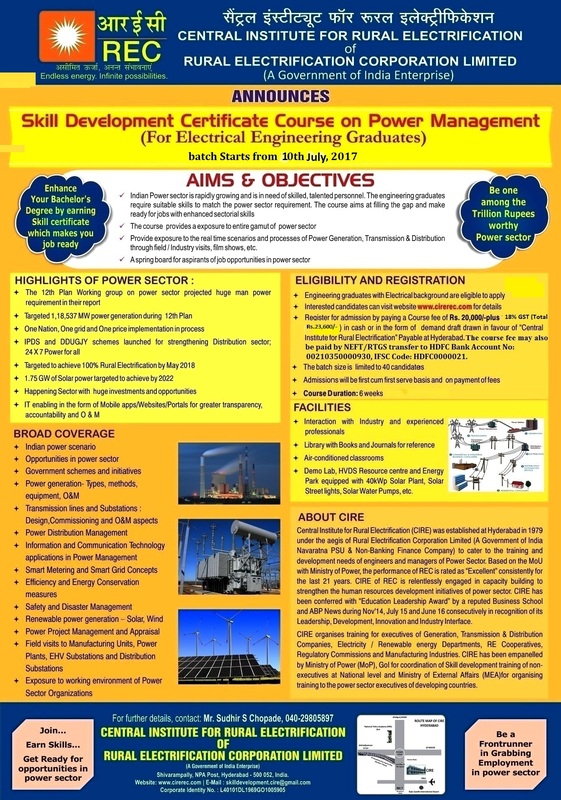 REC Institute for Power Management & Training (RECIPMT) ( Formerly known as Central Institute for Rural Electrification (CIRE)) setup by REC with a vision for developing human resources in standard technologies, attitudes, aptitudes and priorities relating to power sector. It has been in the forefront in imparting training to the power sector executives since a long time. It also considers that constant up-gradation and diversification of its sphere of activities shall be the hall mark of any institute.RECIPMT too has spread into the arenas of Generation, Transmission, Renewable Energy sources and management skills and extended its jurisdiction to include executives of the International Power sector too, through various schemes sponsored by MEA of GOI and various customized programmes taken up on its own. RECIPMT has been rising up to the challenges thrown up by the sector from time to time. It has been coordinating and implementing with the responsibility of training of large number of C&D category of Employees of distribution companies in the XIIth plan. In its endeavour to better its previous performances with updated modules set for the present day needs, RECIPMT has brought forth its annual Calendar of Training Programmes for the year 2018-19 with an earnest plea to the clientele to extend their support, as in the past, to realize the vision of the nation with right technology and skills, economically and efficiently.